It generates a self-renewal dropdown-list of all SmartPost locations in Finland. It takes into account the sizes of the packages and allows setting prices of the SmartPost cabinet sizes. Module allows direct payment from SEB Bank. The configurations use the private key, the public key and snd id. 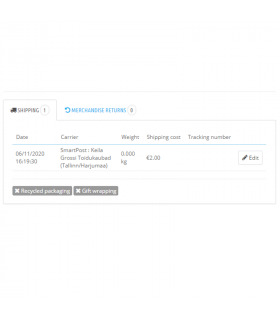 SEB Bank is shown in the order confirmation and in the order detail’s page and in the invoice. Module allows direct payment from Danske Bank. The configurations use the private key, the public key and snd id. 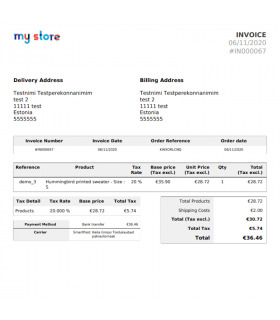 Danske Bank is shown in the order confirmation and in the order detail’s page and in the invoice. Module allows direct payment from Nordea Bank. The configurations use the private key, the public key and snd id. Nordea Bank is shown in the order confirmation and in the order detail’s page and in the invoice. 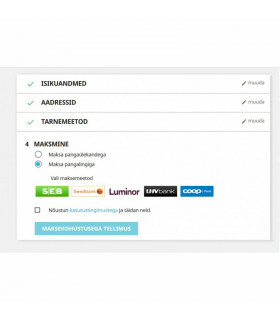 Module allows direct payment from SWEDBANK. The configurations use the private key, the public key and snd id. SWEDBANK is shown in the order confirmation and in the order detail’s page and in the invoice. Sure you do.Subscribe to our Newsletter and receive a 5% discount code on everything. Veebipoed.ee is an ambitious rapidly growing company. 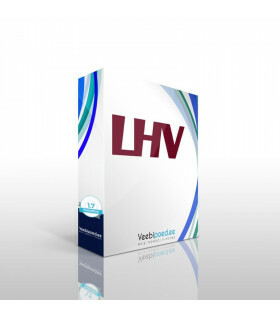 Our goal is to offer full services in creating quality e-commerce solutions. We are here to help with advise and actions starting from the idea until implementation. How will i receive my modules?